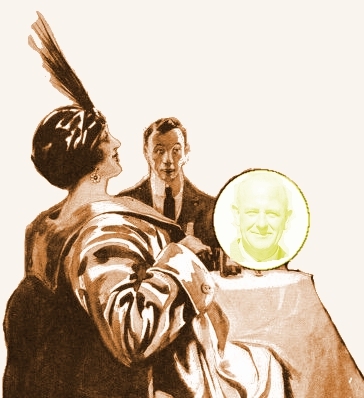 SALLY stared at Ginger Kemp’s vermilion profile in frank amazement. Ginger, she had realized by this time, was in many ways a surprising young man, but she had not expected him to be so surprising as this. Sally began to regain her composure. Her sense of humor was tickled. She looked at Ginger gravely. He did not meet her eye, but continued to drink in the uniformed official, who was by now so carried away by the romance of it all that he had begun to hum a love ballad under his breath. The official could not hear what they were saying, and would not have been able to understand it even if he could have heard, but he was an expert in the language of the eyes. For the first time he turned and faced her, and there was a look in his eyes which touched Sally and drove all sense of the ludicrous out of her. Absurd as it was, this man was really serious. “Well, yes, as a matter of fact, I am,” she said soberly. Ginger Kemp bit his lip, and for a moment was silent. “Oh, well, that’s torn it!” he said at last. SALLY was aware of an emotion too complex for analysis. There was pity in it, but amusement too. The emotion, though she did not recognize it, was maternal. Mothers, listening to their children pleading with engaging absurdity for something wholly out of their power to bestow, feel that same wavering between tears and laughter. Sally wanted to pick Ginger up and kiss him. The one thing she could not do was to look on him, sorry as she was for him, as a reasonable, grown-up man. It was just the diversion from the theme under discussion which Sally had been longing to find. She welcomed the chance of continuing the conversation on a less intimate and sentimental note. Ginger did not appear noticeably elated at the suggested relationship. Sally uttered an indignant cry. “Do you mean to say you haven’t been listening to a word I’ve been saying?” she demanded. Ginger, alert after his unexpected fashion when it became a question of physical action, had followed her through the swing door, and they emerged together and started running down the Square. “Stick it!” said Ginger encouragingly. He was running easily and well, as becomes a man who in his day has been a snip for his international as scrum half. Sally saved her breath. The train was beginning to move slowly out of the station as they sprinted abreast on to the platform. Ginger dived for the nearest door, wrenched it open, gathered Sally neatly in his arms, and flung her in. 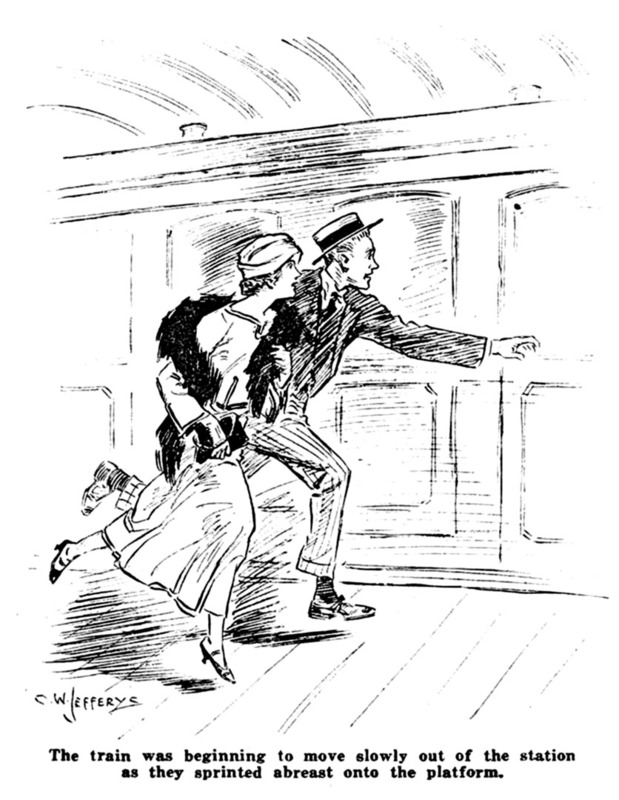 She landed squarely on the toes of a man who occupied the corner seat, and, bounding off again, made for the window. Ginger, faithful to the last, was trotting beside the train as it gathered speed. The train passed smoothly out of the station. Sally cast one last look back at her red-haired friend, who had now halted, and was waving a handkerchief. Then she turned to apologize to the other occupant of the carriage. She found herself facing Ginger’s cousin, the dark man of yesterday’s episode on the beach, Bruce Carmyle. . . .
MR. CARMYLE was not a man who readily allowed himself to be disturbed by life’s little surprises, but at the present moment he could not help feeling slightly dazed. He recognized Sally now as the French girl who had attracted his cousin Lancelot’s notice on the beach. At least, he had assumed that she was French, and it was startling to be addressed by her now in fluent English. How had she suddenly acquired this gift of tongues? And how on earth had she had time since yesterday when he had been a total stranger to her, to become sufficiently intimate with Cousin Lancelot to be sprinting with him down station platforms and addressing him out of railway-carriage windows as Ginger? Bruce Carmyle was aware that most members of that subspecies of humanity, his cousin’s personal friends, called him by that familiar—and, so Carmyle held, vulgar—nickname, but how had this girl got hold of it? If Sally had been less pretty, Mr. Carmyle would undoubtedly have looked disapprovingly at her, for she had given his rather rigid sense of the proprieties a nasty jar. But as, panting and flushed from her run, she was prettier than any girl he had yet met, he contrived to smile. “Not at all,” he said in answer to her question, though it was far from the truth. His left big toe was aching confoundedly. Even a girl with a foot as small as Sally’s can make her presence felt on a man’s toe if the scrum half who is handling her aims well and uses plenty of vigor. She breathed. The train sped on. 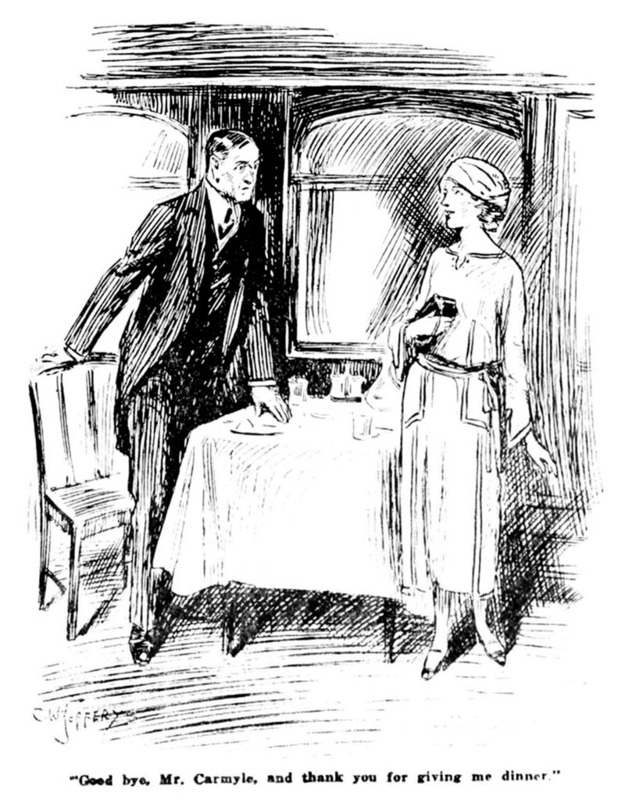 A waiter entered the compartment, announcing in unexpected English that dinner was served in the restaurant car. She reproved herself, as they made their way down the corridor, for being so foolish as to judge anyone by his appearance. This man was perfectly pleasant in spite of his grim exterior. She had decided, by the time they had seated themselves at the table, that she liked him. At the table, however, Mr. Carmyle’s manner changed for the worse. He lost his amiability. He was evidently a man who took his meals seriously and believed in treating waiters with severity. He shuddered austerely at a stain on the tablecloth, and then concentrated himself frowningly on the bill of fare. Sally, meanwhile, was establishing cozy relations with the much-too-friendly waiter, a cheerful old man who from the start seemed to have made up his mind to regard her as a favorite daughter. 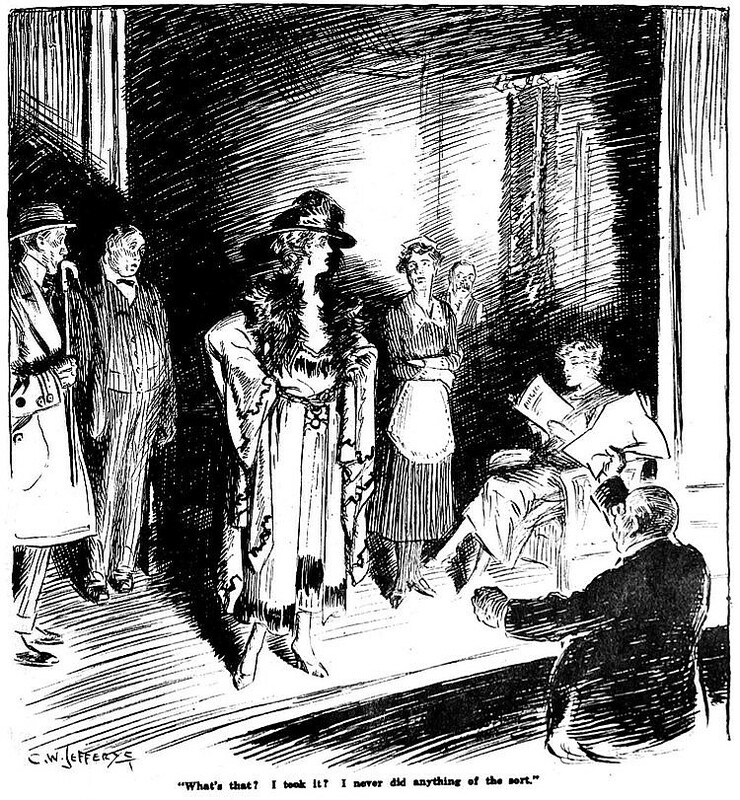 The waiter talked no English and Sally no French, but they were getting along capitally when Mr. Carmyle, who had been irritably waving aside the servitor’s lighthearted advice—at the Hotel Splendide the waiters never bent over you and breathed cordial suggestions down the side of your face—gave his order crisply in the Anglo-Gallic dialect of the traveling Briton. The waiter remarked “Boum!” in a pleased sort of way and vanished. “Nice old man!” said Sally. “Infernally familiar!” said Mr. Carmyle. Mr. Carmyle who since the waiter’s departure had been thawing, stiffened again at the mention of Ginger. Sally did not like his tone. He seemed to be criticizing her, and she resented criticism from a stranger. Her eyes opened wide and she looked dangerously across the table. The mention of the Family was too much for Sally. She had to stop talking in order to allow her mind to clear itself of rude thoughts. “Mr. Kemp was telling me about Mr. Scrymgeour,” she went on at length. Bruce Carmyle stared for a moment at the yard or so of French bread which the waiter had placed on the table. The waiter returned, bearing soup, and dumped it down. “V’la!” he observed with the satisfied air of a man who has successfully performed a difficult conjuring trick. He smiled at Sally expectantly, as though confident of applause from this section of his audience at least. But Sally’s face was set and rigid. She had been snubbed, and the sensation was not as pleasant as it was novel. Snubbed! And by a blue-chinned Englishman! She found herself now disliking Mr. Carmyle with an almost Gingerian intensity. Was it for this that her fathers had bled? Did he suppose that the Spirit of ’76 was in Cain’s Storehouse? If she wanted to talk about Ginger, she was going to talk about Ginger—yes, if the whole British Empire raised its eyebrows. MR. CARMYLE’S attitude was that Sally might be a pretty girl, but she was a stranger, and the intimate affairs of the Family were not to be discussed with strangers, however prepossessing. “Rosbif,” said the waiter genially, manifesting himself suddenly beside them as if he had popped out of a trap. Bruce Carmyle attacked his roast beef morosely. Sally, who was in the mood when she knew that she would be ashamed of herself later on, but was full of battle at the moment, sat in silence. Mr. Carmyle relapsed into an offended dumbness which lasted till the waiter had brought the coffee. She made her way down the car, followed by Bruce Carmyle’s indignant, yet fascinated gaze. Strange emotions were stirring in Mr. Carmyle’s bosom. SOME few days later, owing to the fact that the latter, being preoccupied, did not see him first, Bruce Carmyle met his cousin Lancelot in Piccadilly. They had returned by different routes from Roville, and Ginger would have preferred the separation to continue. He was hurrying on with a nod when Carmyle stopped him. “Just the man I wanted to see,” he observed. “Oh, hullo!” said Ginger without joy. Ginger peered at the proffered case with the vague suspicion of the man who has allowed himself to be lured on to the platform and is accepting a card from the conjurer. He felt bewildered. In all the years of their acquaintance he could not recall another such exhibition of geniality on his cousin’s part. He was surprised, indeed, at Mr. Carmyle’s speaking to him at all, for the Affaire Scrymgeour remained an unhealed wound, and the Family, Ginger knew, were even now in session upon it. Bruce Carmyle had not entirely made up his mind regarding Sally, but on one point he was clear, that she should not, if he could help it, pass out of his life. Her abrupt departure had left him with that baffled and dissatisfied feeling which, though it has little in common with love at first sight, frequently produces the same effects. She had had, he could not disguise it from himself, the better of their late encounter, and he was conscious of a desire to meet her again and show her that there was more in him than she apparently supposed. Bruce Carmyle, in a word, was piqued; and, though he could not quite decide whether he liked or disliked Sally, he was very sure that a future without her would have an element of flatness. “I bet you did,” said Ginger enviously. “Why?” said Ginger, suspiciously. His attitude toward Sally’s address resembled somewhat that of a connoisseur who has acquired an unique work of art. He wanted to have it to himself and gloat over it. “Well, these particular books are not,” said Mr. Carmyle shortly. He was finding Ginger’s reserve a little trying, and wished that he had been more inventive. “Give them to me and I’ll send them to her,” suggested Ginger. GINGER revealed the sacred number of the holy street which had the luck to be Sally’s headquarters. He did it because with a persistent devil like his cousin there seemed no way of getting out of it, but he did it grudgingly. “Thanks.” Bruce Carmyle wrote the information down with a gold pencil in a dapper little morocco-bound notebook. He was the sort of man who always has a pencil, and the backs of old envelopes never entered into his life. There was a pause. Bruce Carmyle coughed. “I saw Uncle Donald this morning,” he said. His manner had lost its geniality. There was no need for it now, and he was a man who objected to waste. He spoke coldly, and in his voice there was a familiar sub-tinkle of reproof. “Yes?” said Ginger moodily. This was the uncle in whose office he had made his début as a hasher—a worthy man, highly respected in the National Liberal Club, but never a favorite of Ginger’s. There were other minor uncles and a few subsidiary aunts who went to make up the family, but Uncle Donald was unquestionably the managing director of that body, and it was Ginger’s considered opinion that in this capacity he approximated to a human blister. Ginger’s depression deepened. A dinner with Uncle Donald would hardly have been a cheery function even in the surroundings of a banquet in the Arabian Nights. There was that about Uncle Donald’s personality which would have cast a sobering influence over the orgies of the Emperor Tiberius at Capri. To dine with him at a morgue like that relic of Old London, Bleke’s Coffee House which confined its custom principally to regular patrons who had not missed an evening there in half a century, was to touch something very near bedrock. Ginger was extremely doubtful whether flesh and blood were equal to it. “All right,” said Ginger gloomily. The two men went their ways, Bruce Carmyle eastward because he had clients to see in his chambers at the Temple; Ginger westward because Mr. Carmyle had gone east. There was little sympathy between these cousins; yet, oddly enough, their thoughts as they walked were centered on the same object. Bruce Carmyle, threading his way briskly through the crowds of Piccadilly Circus, was thinking of Sally, and so was Ginger as he loafed aimlessly toward Hyde Park Corner, bumping in a sort of coma from pedestrian to pedestrian. SINCE his return to London Ginger had been in bad shape. He mooned through the days and slept poorly at night. If there is one thing rottener than another in a pretty blighted world, one thing which gives a fellow the pip and reduces him to the condition of an absolute onion, it is hopeless love. Hopeless love had got Ginger all stirred up. His had been hitherto a placid soul. Even the financial crash which had so altered his life had not bruised him very deeply. His temperament had enabled him to bear the slings and arrows of outrageous fortune with a philosophic “Right-ho!” But now everything seemed different. Things irritated him acutely which before he had accepted as inevitable—his Uncle Donald’s mustache, for instance, and its owner’s habit of employing it during meals as a sort of zareba or earthwork against the assaults of soup. Hard thoughts . . . . hard thoughts! And getting harder all the time, for nothing grows more quickly than a mood of rebellion. Rebellion is a forest fire that flames across the soul. The spark had been lighted in Ginger, and long before he reached Hyde Park Corner he was ablaze and crackling. By the time he returned to his club he was practically a menace to society—to that section of it, at any rate, which embraced his uncle Donald, his minor uncles George and William, and his aunts Mary, Geraldine, and Louise. Nor had the mood passed when he began to dress for the dismal festivities of Bleke’s Coffee House. He scowled as he struggled morosely with an obstinate tie. One cannot disguise the fact Ginger was warming up. And it was just at this moment that Fate, as though it had been waiting for the psychological instant, applied the finishing touch. There was a knock at the door, and a waiter came in with a telegram. Remember. Death to the Family. S.
Ginger sat down heavily on the bed. The driver of the taxicab which at twenty-five minutes past seven drew up at the dingy door of Bleke’s Coffee House in the Strand was rather struck by his fare’s manner and appearance. A determined-looking sort of young bloke, was the taxi-driver’s verdict. IT HAD been Sally’s intention, on arriving in New York, to take a room at the St. Regis and revel in the gilded luxury to which her wealth entitled her before moving into the small but comfortable apartment which, as soon as she had time, she intended to find, and make her permanent abode. But when the moment came and she was giving directions to the taxi-driver at the dock, there seemed to her something revoltingly Fillmorian about the scheme. It would be time enough to sever herself from the boarding house which had been her home for three years when she had found the apartment. Meanwhile, the decent thing to do, if she did not want to brand herself in the sight of her conscience as a female Fillmore, was to go back temporarily to Mrs. Meecher’s admirable establishment and foregather with her old friends. After all, home is where the heart is, even if there are more prunes there than the gourmet would consider judicious. Perhaps it was the unavoidable complacency induced by the thought that she was doing the right thing, or possibly it was the tingling expectation of meeting Gerald Foster again after all these weeks of separation, that made the familiar streets seem wonderfully bright as she drove through them. It was a perfect crisp New York morning, all blue sky and amber sunshine, and even the ash cans had a stimulating look about them. The street cars were full of happy people rollicking off to work, policemen directed the traffic with jaunty affability, and the white-clad street cleaners went about their poetic tasks with a quiet but none the less noticeable relish. It was improbable that any of these people knew that she was back, but somehow they all seemed to be behaving as though this were a special day. The first discordant note in this overture of happiness was struck by Mrs. Meecher, who informed Sally, after expressing her gratification at the news that she required her old room, that Gerald Foster had left town that morning. SALLY was disappointed. New York was so wonderful after the dull voyage in the liner that she was not going to allow herself to be depressed without good reason. After all, she could go on to Detroit to-morrow. It was nice to have something to which she could look forward. “Oh, is Elsa in the company?” she said. Mrs. Meecher, not unwillingly, for she was a woman who enjoyed the tragedies of life, made her second essay in the direction of lowering Sally’s uplifted mood. “Poor old gentleman, he ain’t over and above well. Went to bed early last night with a headache, and this morning I been to see him and he don’t look well. There’s a lot of this Spanish influenza about. It might be that. Lots o’ people been dying of it, if you believe what you see in the papers,” said Mrs. Meecher buoyantly. THE invalid’s eyes, as Sally entered the room, turned wearily to the door. “How did it look?” asked Mr. Faucitt eagerly. Sally was in no mood to listen to the adventure of Mr. Fothergill. The old man’s innocent criticism of Gerald had stabbed her deeply. A momentary impulse to speak hotly in his defense died away as she saw Mr. Faucitt’s pale, worn old face. He had meant no harm, after all. How could he know what Gerald was to her? Sally found her composure restored. Her lecture on the night of the party had evidently, she thought, not been wasted. Mr. Faucitt, however, advanced another theory to account for the change in the Man of Destiny. IT WAS not till the following Friday that Sally was able to start for Detroit. She arrived on the Saturday morning and drove to the Hotel Statler. Having ascertained that Gerald was stopping in the hotel and having phoned up to his room to tell him to join her, she went into the dining room and ordered breakfast. She was pouring out her second cup of coffee when a stout young man of whom she had caught a glimpse as he moved about that section of the hotel lobby which was visible through the open door of the dining room, came in and stood peering about as though in search of someone. The momentary sight she had had of this young man had interested Sally. She had thought how extraordinarily like he was to her brother Fillmore. Now she perceived that it was Fillmore himself. Fillmore’s ample face registered emotion. “How could it have been your fault?” asked Sally wonderingly. Love seemed to have had the worst effect on Fillmore’s mentality. Fillmore’s voice trailed off into pained silence. “Well, I’m only human,” argued Fillmore. He had certainly changed for the better since their last meeting. It was as if some one had punctured him and let out all the pomposity. If this was due, as Mr. Faucitt had suggested, to the influence of Miss Winch, Sally felt she could not but approve of the romance. “I’ll introduce you some time,” said Fillmore. FILLMORE retired, and Sally settled down to wait for Gerald, no longer hurt by his manner over the telephone. Poor Gerald! No wonder he had seemed upset. A few minutes later he came in. Gerald did not seem interested either by the news of Mr. Faucitt’s illness or by the fact that Sally, after delay, had at last arrived. He dug a spoon somberly into his grape-fruit. Sally was listening with a growing feeling of desolation. She tried to be fair, to remember that he had had a terrible disappointment and was under a great strain. And yet—it was unfortunate that self-pity was a thing she particularly disliked in a man. Her vanity, too, was hurt. It was obvious that her arrival, so far from acting as a magic restorative, had effected nothing. She could not help remembering, though it made her feel disloyal, what Mr. Faucitt had said about Gerald. She had never noticed before that he was remarkably self-centered, but he was thrusting the fact upon her attention now. “I SEE,” said Sally shortly. She had never felt so wretched in her life. Gerald accepted the invitation. He spoke at considerable length, though with little variety. It appeared definitely established in his mind that Providence had invented Spanish influenza purely with a view to wrecking his future. But now he seemed less aloof, more open to sympathy. The brief thunderstorm had cleared the air. Sally lost that sense of detachment and exclusion which had weighed upon her. Sally went out and rang for the elevator to take her to her room. . . .
“Tiddly-omty-om,” was the derby-hatted one’s surprising reply. “Tiddly-omty-om; . . . long speech ending in ‘find me in the library.’ And exit,” said the man in the derby hat, starting to do so. For the first time Sally became aware of the atmosphere of nerves. Mr. Bunbury, who seemed to be a man of temperament, picked up his walking stick, which was leaning against the next seat, and flung it with some violence across the house. “For God’s sake!” said Mr. Bunbury. “Now what?” inquired the derby hat, interested, pausing halfway across the stage. “You don’t want me to go over the whole thing?” asked the derby hat amazed. “Not the whole d——— thing?” queried the derby hat, fighting with incredulity. This seemed to strike the erring Teddy, if not as reasonable, at any rate as one way of looking at it. He delivered the speech in an injured tone and shuffled off. The atmosphere of tenseness was unmistakable now. Sally could feel it. THE new arrival stopped and looked out over the footlights. “Hello!” said Miss Winch amiably. “That’s right. So you did,” admitted Miss Winch chummily. “SHALL I say my big speech now?” inquired Miss Winch over the footlights. “Did you ring, madam?” said Miss Winch to Elsa, who had been reading her magazine placidly through the late scene. The rehearsal proceeded, and Sally watched it with a sinking heart. It was all wrong. Novice as she was in things theatrical, she could see that. A shrill, passionate cry from the front row, and Mr. Bunbury was on his feet again. Sally could not help wondering whether things were going particularly wrong to-day or whether this was one of Mr. Bunbury’s ordinary mornings. The advice appeared to strike Mr. Bunbury as good. He threw back his head and bayed like a bloodhound. There was a momentary pause, and then from the wings on the prompt side there shambled out a stout and shrinking figure, in whose hand was a script of the play and on whose face, lit up by the footlights, there shone a look of apprehension. It was Fillmore, the Man of Destiny. . . .
ALAS, poor Fillmore! He stood in the middle of the stage with the lightning of Mr. Bunbury’s wrath playing about his defenseless head, and Sally, recovering from her first astonishment, sent a wave of sisterly commiseration floating across the theatre to him. And as she listened to the fervid eloquence of Mr. Bunbury, she perceived that she had every reason to be. Fillmore was having a bad time. “And it walked away, I suppose,” said Miss Hobson with cold scorn, pausing in the operation of brightening up her lower lip with a lip stick. SENSATION in court. The prisoner, who seemed to feel his position deeply cast a pop-eyed glance full of gratitude at his advocate. Mr. Bunbury, in his capacity of prosecuting attorney, ran his fingers through his hair in some embarrassment, for he was regretting now that he had made such a fuss. Miss Hobson, thus assailed by an underling, spun around and dropped the lip stick, which was neatly retrieved by the assiduous Mr. Cracknell. Mr. Cracknell had his limitations, but he was rather good at picking up lip sticks. Miss Hobson seemed taken aback. Her composure was not restored by Mr. Bunbury’s next remark. “Well, I hate cats,” said Miss Hobson as though that settled it. “Nazimova never—’’ began Mr. Bunbury. SALLY was tingling all over. This reminded her of the dog fight on the Roville sands. She wanted to be in it, and only the recognition that it was a private fight, and that she would be intruding, kept her silent. The lure of the fray, however, was too strong for her wholly to resist it. Almost unconsciously she had risen from her place and drifted down the aisle so as to be nearer the white-hot center of things. She was now standing in the lighted space by the orchestra pit, and her presence attracted the roving attention of Miss Hobson who, having concluded her remarks on authors and their legitimate sphere of activity, was looking about for some other object of attack. Sally found herself an object of universal scrutiny, and wished that she had remained in the obscurity of the back rows. “I am Mr. Nicholas’s sister,” was the best method of identification that she could find. “I’m through!” announced Miss Hobson. It appeared that Sally’s presence had in some mysterious fashion fulfilled the function of the last straw. Sally trotted up the steps which had been propped against the stage to form a bridge over the orchestra pit. The late debaters had split into groups. Mr. Bunbury and Gerald were pacing up and down the central aisle, talking earnestly. Fillmore had subsided onto a chair. “Do you know Gladys Winch?” asked Elsa. Sally shook hands with the placid lodestar of her brother’s affections. Miss Winch on closer inspection proved to have deep gray eyes and freckles. Sally’s liking for her increased. “Oh, I don’t know,” said Miss Winch. She made her way to that picturesque ruin. Magazine had “All that was done at our last encounter”; corrected to “gone” as in other versions.